Yosemite National Park has free year-round shuttle bus service in eastern Yosemite Valley with stops at most major sites of interest and some trailheads. This webpage describes the main year-round route, and has maps of the areas at the bus stops, as well as a few trail maps from some of the stops. and links to local weather and air quality reports. 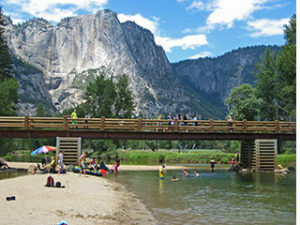 A second free summer valley bus route, the El Capitan Shuttle (El Cap shuttle), runs from the Yosemite Valley Visitor Center with stops at Camp 4 (the actual Camp 4 campground, not the main bus system Camp 4 bus stop #7 across the road), El Capitan picnic area, (in the vicinity of) El Capitan, Cathedral Beach Picnic Area and the Four Mile trailhead, from “late may or mid June to early October, from 9 a.m. to 5 p.m.” / every 30 minutes (and again, it is not on a strict schedule). This bus is the same size/shape/color(s), as the free valley shuttle that runs to a multitude of east Yosemite valley stops described below, but it has a big sign on the side that says El Capitan Shuttle. And in the winter there is a free winter bus to Yosemite Ski and Snow area (Badger Pass) for (fee) ski/snowboard (free or very low cost) snow shoe walk with a Ranger naturalist that has a more strict schedule than the main free shuttle bus. 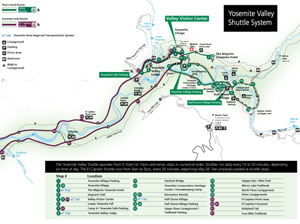 http://www.travelyosemite.com/media/610220/yssa-shuttle-schedule_2017.pdf. YARTS bus stops, routes, consult the interactive map at: http://map.yarts.com/ which includes nearby RV parks. The Yosemite valley stops are often at the same bus stop/ or next to/near some bus stops for the free valley shuttle. Connections to Greyhound buses, Amtrak Railroad passenger service and local airports are available. People used to be able to drive around Yosemite valley and find small parking lots at each of the visitor centers, trailheads (the start of a trail), stores, restaurants, etc. When the valley became crowded, (especially crowded in warm months), the park got rid of most of the parking lots for park visitors at the visitor centers, etc. (with the exception of a few parking spaces for people with a handicapped permit). People are now asked to, in effect, Park and Ride: park their car at their campsite or hotel or one of three large day use parking lots, leave it there, and ride the shuttle, ride bikes or jog / hike / walk / stroll. Except when road repairs are being done or during the winter in snowy/icy conditions (when some road sections might be closed), or when a bus is too full for more passengers, the main free Yosemite Valley Visitor Shuttle buses drive the same route, making stops in numerical order. The shuttle buses usually run during government shutdowns. Once people understand the route most of the buses use, they can switch buses at a couple of major stops to cut a half hour or more off the time needed to get to their destination. Plus, the best stops for some activities, the best stop to start a particular hike and the best stops for some overnight accommodations are not completely obvious. I suggest you print a copy and use it to reference the descriptions below of what you can find at each stop. The Yosemite valley main shuttles run every ten to 20 minutes, depending on the time of day, and depending on traffic (usually from 7 a.m. to 10 p.m.). In seasons other than summer, buses sometimes run every 30 minutes. They are not on a strict schedule, such as city bus systems. If traffic is heavy, they might be slower than the ten to 20 minutes intervals. Sometimes two or three buses can arrive at a bus stop right after each other. Sometimes one of the multiple buses arriving at a stop may let off passengers and drive off without picking up any, due to needs for space onboard at a following stop. and info about other park buses outside of Yosemite Valley. 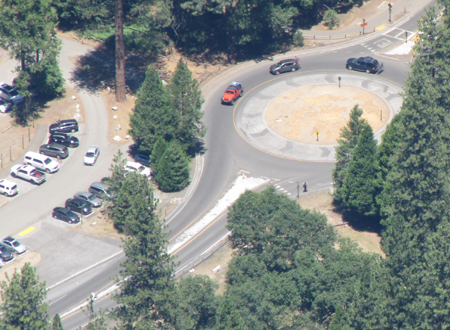 1) Yosemite village visitor parking at a turnout just off of the (new in 2017) roundabout (one way circular roadway), is a large Day Use parking lot (see map). This day use parking lot is also known as “Camp Six”. It is just south of Yosemite Village. It can sometimes be faster to walk north to the biggest Yosemite grocery, Valley Visitor Center, museum, Post Office, and Village restaurants than to wait for a bus, especially during high usage times. (See descriptions of these at stops 2, 4 and 5 below). Pedestrians should be careful to watch out for drivers who are confused about the round-about (see map) and not watching for pedestrians. 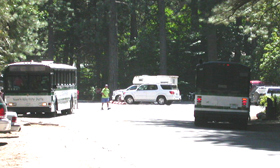 In the photo below of bus stop #1, you can see, in the foreground, a vehicle entering the round-about from the east, (the direction of the Pines campgrounds). Drivers might also want to consult the Parking and traffic jams in Yosemite valley tips and tricks. 2) Yosemite Village A little down from the front of the main grocery store and Village Grill. The main store has the biggest selection of food and gifts, toys, Yosemite logo clothes. 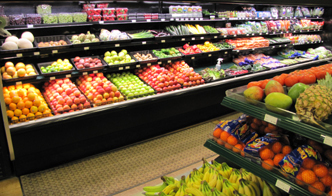 It has some of each type of food you might expect at a grocery at home including prepared main dishes, sandwiches, prepared salads with a dressing packet, snacks, deli items, diary, bakery items, frozen foods, cooking gear and much more. (You will find a bigger selection of lower cost, sometimes fresher produce in larger grocery stores near home, so bring your own.) See also a list of usually stocked over-the-counter medications below the medical center info below. Next to the store used to be the Art Activity Center https://www.yosemiteconservancy.org/happy-isles-art-and-nature-center with lessons and programs “for artists of all ages and abilities.” These programs were moved to the Happy Isles Visitor Center, shuttle stop 16, and the building was taken down in late 2017/early 2018, to “be restored to a seasonal wetland in 2018.” The Happy Isles location will usually be open late March through October. Behind the store and across the back parking lot and across a road is the small Village Garage (see lower right corner of the map above). 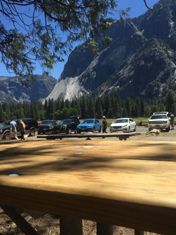 Details about 24 hour towing within the park, propane service, emergency repairs, how to use your Auto Association card to get their help, electric vehicle (EV) charging stations and more are at Yosemite garage, car repairs and towing. There is no bus stop for the Yosemite valley Medical Clinic (see upper right hand corner of the map above) but it is a short walk from the main grocery store on the road to the Majestic (Ahwahnee). Hours can change, but usually open M-F 9-5 (additional weekend hours some summers, for example, 9 a.m. – 7 p.m. seven days a week, walk-ins until 6:30 p.m.) closed major holidays and when the doctor is out of town, but with 24 hour/seven days a week ambulance. For ambulance service call 911, (or 9-911 from a Yosemite hotel room, but please verify this when you check in). They can do a “limited array of lab tests, basic X-rays” (occasionally due to staffing limitations, they can be without X-ray capability from time to time) urgent care such as “illness evaluation and treatment (colds, flu, and infections) and injury care (fractures, sprains, strains, cuts, abrasions)”. They no longer have a dental clinic. Parking at the Medical Clinic is only for customers, no day use parking is allowed. The medical clinic does not sell over-the-counter medications, but you can buy them at the main Yosemite Valley grocery, including, but not limited to, brand name and some generic, (adult and in some cases children’s) pain relief, allergy, stomach upset, cough syrups and lozenges, first aid supplies, and lots more. The list got a bit long for this webpage so I moved it to: Over-the-counter medications and toiletries available in Yosemite. When a helicopter needs to land in the Ahwahnee meadow across the road from Church Bowl, to pick up someone who needs to go to a bigger hospital, (or when a helicopter needs to land for Search and Rescue training) people are asked to stay on the restroom/picnic area side of the road, and traffic going through is stopped. Because you won’t know a helicopter is coming and won’t be able to move your vehicle fast enough, the entire meadow side of the road at Church Bowl is closed to any parking at all times, (even to get out and quickly take a picture or use the restroom). 3) The Majestic (Ahwahnee) Hotel bus stop is just out into the parking lot, not under the cover of the porte-cochere (roofed driveway by the hotel main entrance). The shuttle stop, the Sweet Shop with the chocolate truffles, restaurants (and a link to the menus), and much more are shown on this Majestic Yosemite Hotel map. The schedule for free one hour tours of the hotel can be found in the the newspaper Yosemite Today, which you usually receive a copy of when you enter the park, or you can download / read before your trip. 4) At the corner of Degnan’s (Deli / Loft / Cafe / Kitchen) in Yosemite Village, right across the street from the north end of the Village grocery store and Village Grill complex. Park rangers on duty to answer questions, exhibits, park info presentations, and bookstore with maps, books, postcards, posters, calendars, clothes (with discounts for Yosemite Conservancy donors). Even when the visitor center is closed (early morning or overnight or during government shutdowns) you can find a lot of info about trails, with color aerial photos with trails marked at two displays outside the visitor center, to the right in the photo above. 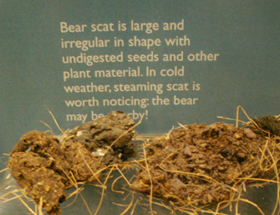 There are history, geological and nature displays. Two films play every half hour play in the theater behind the main building. (Mon.- Sat. 9:30 a.m. to (last film) 4:30 p.m. (Sunday first showing at noon). Yosemite – a Gathering of Spirit by Ken Burns (you can watch it at: http://www.pbs.org/video/2365316730/) shows on the hour and The Spirit of Yosemite a great visitor orientation film with some swooping aerial views along with history and scenes from all seasons and all parts of the park, shows on the half hour. Free. 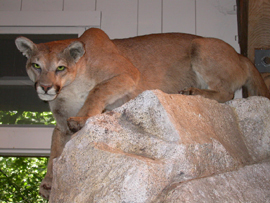 Both films are captioned and an audio transcription of Spirit of Yosemite is available at the information counter in the Valley Visitor Center. and then next to the right as you face the Visitor Center, the Wilderness Center, (open spring to fall for backcountry permits and bear canister rentals, with displays on pre-trip planning, minimum impact and Yosemite’s wilderness). Further to the right is the U.S. Post Office. To the left as you face the Visitor Center is the Yosemite Museum (Indian Cultural Museum)/store. 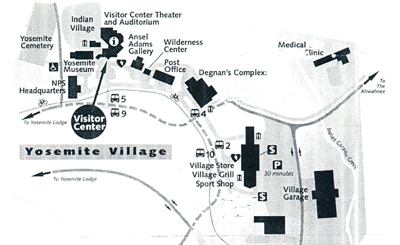 Restrooms are located a little behind and between the Visitor Center and the Indian Cultural Museum. 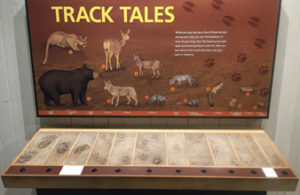 In front of the Indian Cultural Museum is a cross‐section of a Giant Sequoia tree that visitors can touch and a re-creation of an umacha, a Miwok and Paiute cedar bark house. 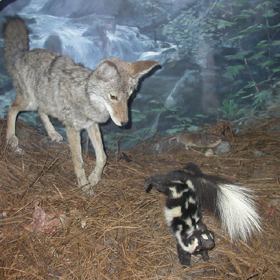 Museum exhibits are listed at https://www.nps.gov/yose/learn/historyculture/museum-exhibit.htm including links to some displays after an exhibit has closed. The valley museum occasionally features paintings and watercolors. 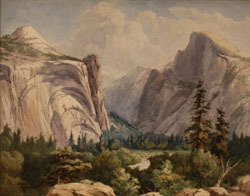 https://museum.nps.gov/ParkPList.aspx and search for Yosemite National Park. 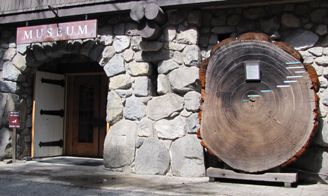 The Indian Cultural Exhibit, (which interprets the cultural history of Yosemite’s Miwok and Paiute people from 1850 to the present) Village of the Ahwahnee, is behind the visitor center. Sometimes staff present programs about Ahwahneechee skills and culture. This stop also has stops next to it for the El Cap summer shuttle and the summer express bus to and from the main day use parking, Yosemite Village day-use parking, at stop #1. Cell phone service is usually okay in the vicinity of the main visitor center. 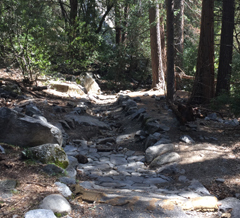 6) At the end of the loop path to the base of lower Yosemite Fall (almost all relatively flat walk, one mile (1.6 kilometers) round trip). 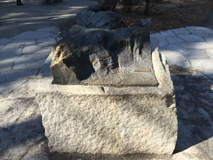 At the bus stop, near the bus stop, and at the restrooms/picnic area a bit up a path to your to your left, you will find maps of the lower Yosemite Fall loop trail, or actually more a path/walkway, to the base of lower Yosemite Fall. The river is in blue, loop trail is in brown, the bridges over the river are in tan, the main road (Northside Drive) at the bottom of this picture of the map is in gray. Shuttle bus stop #6 is in the lower right hand corner of this map. There are restrooms and picnic area (no grills) next to the restrooms . Along this walk you can find the location of John Muir’s hang nest (cabin he built in a tree) At that webpage you can read warnings about the real dangers of trying to swim in the pool at the base of the fall. Suggest you try swimming at a beach at Swinging Bridge instead, see stop #7 or at Housekeeping camp, stop 12. Please walk your bike on this path/trail, even though it is paved. From the far west pathway (or from the Yosemite Lodge) along this loop trail, the view of Yosemite Falls (lower, middle and upper, in full flow in February 2017). 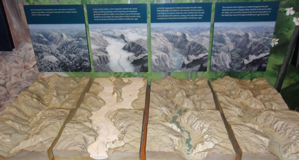 A bronze relief map along the western trail depicts the watershed that drains into Yosemite Falls and shows the trails. Upper Yosemite Fall held stationary in mid-air. There is no bus stop across the street going in the opposite direction. For example, if you come from the Visitor Center or campgrounds direction and you get off at this stop (#6) to do the hike to the base of lower Yosemite Falls, if you want to catch a bus returning in the same direction, you need to walk to stop 8 at the Yosemite Lodge to catch it or climb on again at stop six and ride the bus for a couple of stops until it comes back around. A quick walk you should not miss is in the vicinity. At shuttle bus stop #6, looking across the road at a cross walk near the bus stop, you can see a meandering path leading to a pedestrian bridge over the river (Superintendent’s Bridge). 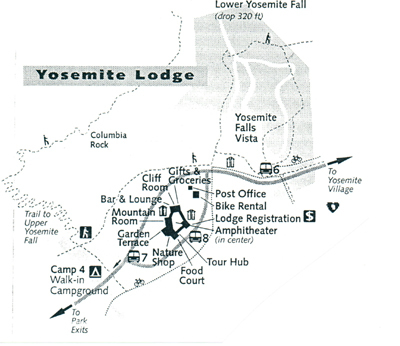 7) Yosemite Lodge day-use parking lot at the end of the path to Swinging Bridge. and the trailhead to Columbia Rock / Upper Yosemite Falls. 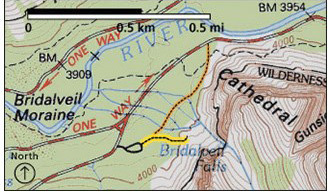 See this map of Camp 4 . Upper Yosemite Fall hike has details. Camp Four to Columbia Rock is 2 miles (3.21 kilometers) round trip, 1,000 feet (304 meters) elevation gain. Camp 4 to top of Yosemite falls is 7.2 miles (11.59 kilometers) round trip, 2,700 foot (823 meters) elevation gain. Stop 7 is closer than stop 8 to the Yosemite Lodge hotel building Laurel. A short walk from stop 7 is Swinging Bridge (which does not swing anymore) and a good swimming area (in season) with shallow and deep water, sandy beaches and views of Yosemite Falls. Across the bridge is a large picnic area with tables, grills and accessible vault toilets (bring your own water or purify some from the river). 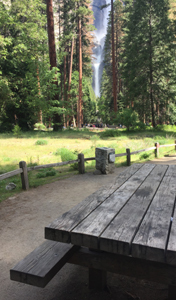 Some of the picnic tables have views through the trees of Yosemite Falls. 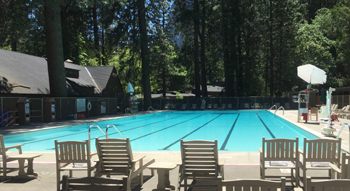 See details at: swimming in Yosemite including thunderstorms, bacteria in the water, safety issues, favorite beaches, swimming pools with lifeguards. 8) Yosemite Lodge, just across the road from the hotel lobby, tour desk, restaurants, gift shops. Guests of the Yosemite Lodge and people who are not guests at the lodge can rent a bike there. To pay and arrange for a rental go into the lobby and find the tour desk. Pick up the bike near the pool (see map above). The Coffee Corner is now a Starbucks (also known as the Starbucks at Base Camp Eatery) with the usual beverages / snacks you expect. Cooking in/around Yosemite Lodge rooms is not allowed, but there is a picnic area, with picnic tables, fire grates, a swimming beach a short walk from the hotel, see map to Swinging Bridge at swimming in Yosemite National park and another nearby picnic area, with restrooms, picnic tables but without fire grates, across Northside Drive from the Lodge, about equidistant between bus stops 8 and 6. 10) directly across the street from the main grocery in Yosemite Village, across the street and down a little from stop #2. Near sunset you will find lines of photographers on Sentinel Bridge waiting to see if Half Dome turns gold or pink. The parking lot just north of Sentinel Bridge is one of the best places to take pictures of moonbows (lunar rainbows during a full moon in spring) on upper Yosemite Fall. A short side trip to a great display about major floods when Yosemite valley has literally become a lake can be found from this bus stop. The section of a shuttle bus map below shows stop #11 at the right. Go through the parking lot to a path / trail some times of the year with large puddles (dotted black line in the mini-map above), roughly parallel to the Merced river, and take a left hand turn to a section of pathway (the red dotted line) towards Superintendent’s bridge. 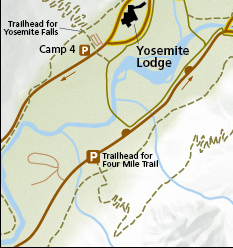 The bridge is just below the letter “M” in the words Yosemite Lodge. 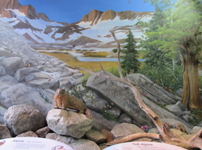 12) YCHC – Yosemite Conservation Heritage Center (formerly LeConte Memorial Lodge) (library, children’s corner, displays, occasional programs). Across the road from bus stop 12 you will find Housekeeping Camp, (open more or less April to October, weather permitting) with showers and laundromat – the laundromat is usually open through the winter even when housekeeping units are not open. To find the laundromat, bear left when you enter the Housekeeping parking lot. See details about swimming in the river at: swimming in Yosemite including thunderstorms, bacteria in the water, safety issues, favorite beaches, swimming pools with lifeguards. Ice Rink location some winters, pay to skate at stop 13B. Pay to rent a raft at stop 13B or most years at any Yosemite Valley hotel tour desks/kiosks. some years, farther down the road. 13B) Half Dome (Curry) Village in front of Stoneman Cottage, (Stoneman is on the right in the photo below). Pay phones outside the office. Guests at Half Dome Village and people who are not guests at Half Dome Village can book a tour, pay to rent a bike or a raft, or pay for ice rink use/ skate rental at the little Tour Kiosk between the front office and Stoneman Cottage, (with the lights above the sign saying Ice Skating, in the winter photo above). 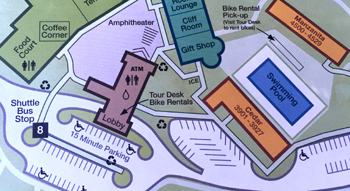 On the map below, check in for your room or tent cabin at the front office (lavender/pink box on the map below). 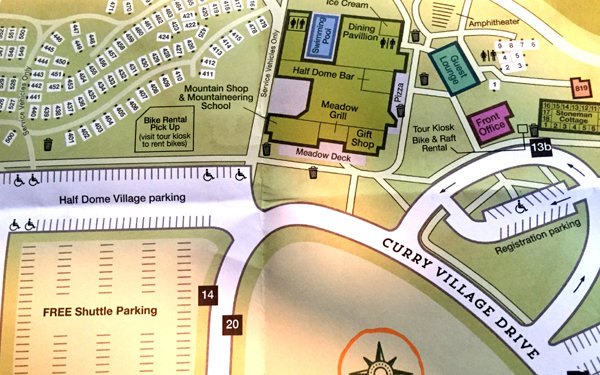 The Bike Rental Pick Up area is to the west of the stores and food, north of the parking lot. This photo of bike rentals pick-up area is taken from the direction of the Half Dome Village (formerly Curry Village) guest parking lot. 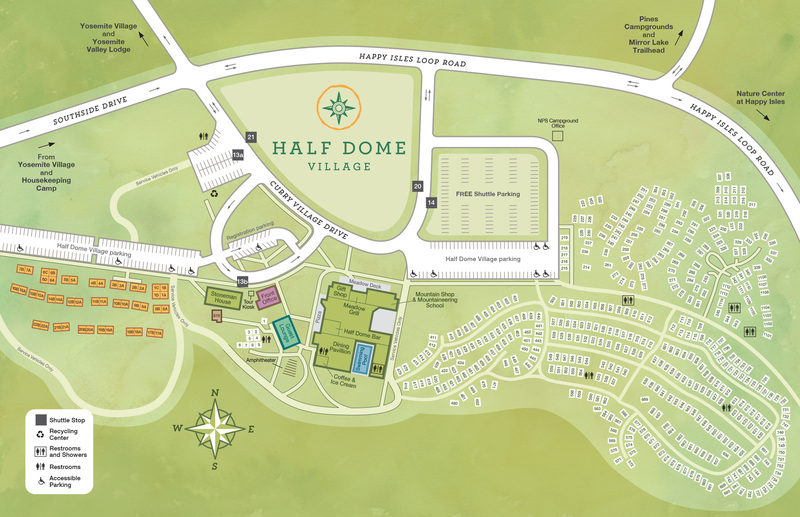 14) Half Dome (Curry) Village parking (across the road from stop 20). If you will be parking here, see the map of the Half Dome (Curry) Village parking lot, and advice at Parking and Traffic Jams in Yosemite valley tips and tricks. After a major snowfall the buses do not run to stops (15, 16, 17 and 18, sometimes 19 as well) on the Happy Isles loop road. 15) Upper Pines campground, (across the road towards Half Dome (Curry) Village from the campground) and near the backpackers trailhead parking lot, across the road from the end of the first loop of campsites. 16) Happy Isles with (on the bus stop side of the river) restrooms, a nature center, Art Activity Center (https://www.yosemiteconservancy.org/happy-isles-art-and-nature-center with lessons and programs “for artists of all ages and abilities, usually open late March through October), and a fen (marsh). Summer Junior Ranger Walks often start at Happy Isles. Across a bridge, up the road to the right, is the trailhead for the mist trail and the rest of the John Muir Trail including to Vernal Fall, Nevada Fall, Half Dome and . . . Mount Whitney. The Happy Isles Visitor Center (usually not open in the winter) is up a side trail on the other side of the river from the popular John Muir trail and can be easily overlooked, but it is well worth a stop. It has natural history exhibits including the animals pictured below, tree and geology explanations. 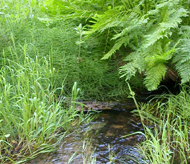 Nearby are short trails focusing on the Happy Isles environment: forest, river, talus slope and the fen (marsh). 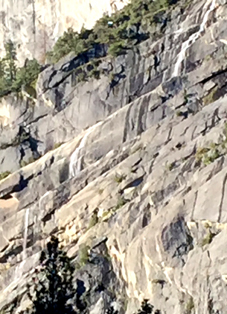 Yosemite Valley rockfalls has year-in-review rockfall reports from/through 2008, and rockfall safety tips from the Wilderness Safety Action Team. 17) Mirror Lake junction (service sometimes ends earlier than other stops). The path to Mirror Lake from this stop is steep in parts, but wheelchair accessible. 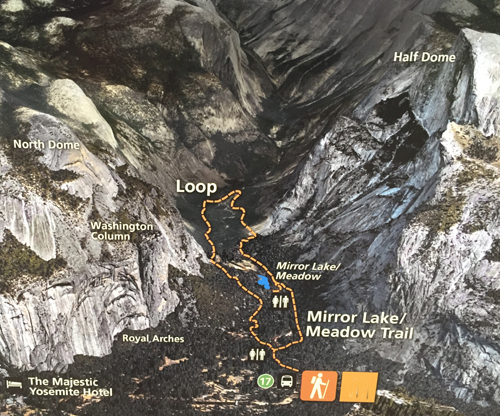 The map below shows the loop trail to Mirror Lake from stop #17 (but also see an alternative trail from the Ahwahnee (temporarily named the Magestic Yosemite Hotel) at stop 3 shown about half way down the webpage at this hotel map). 18) North Pines campground and stable, you can no longer ride horses in Yosemite Valley, go instead to the Wawona (Big Trees) stable. At Wawona is also where you can pay for a horse-drawn stage ride. 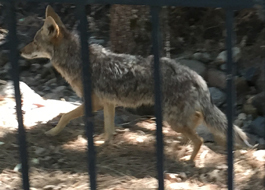 “From approximately late May through September, a daytime kennel is available at the Yosemite Valley Stable, stop #18. You must provide written proof of immunizations (rabies, distemper, parvo, and bordetella) from your veterinarian. Dogs under 20 pounds may be considered if you provide a small kennel. 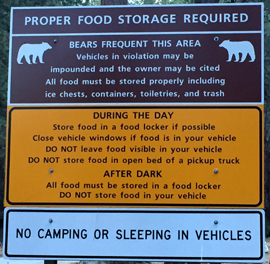 No food is allowed, due to wildlife management concerns. Because of limited kennel space, advanced reservations are highly recommended. Contact 209.372.8326 for more information.” And all this is subject to change. 19) Pines campground at the entrance to Lower Pines, which has three double campsites, (Upper Pines campground entrance is across the road, North Pines campground is up the road and over a bridge). 21) across the road from stop 13A, Half Dome (Curry) Village recreation rentals, raft pick-up, ice rink in winter. Pay at stop 13B to rent the raft(s) or to ice skate. – – – Most drivers prefer you wait until everyone has finished getting off before you get on, the same as any transit system in the rest of the world. Everyone should enter the bus at the front door. No one should get on at the back EXIT ONLY doors unless the driver says it is okay. – – – Most drivers prefer you exit from the back, but will sometimes tell passengers they can exit any door. 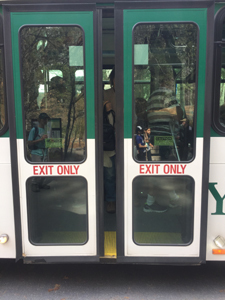 OR, if you ask politely, the bus driver might let you and your huge backpack / stroller exit from the front where you got on instead of going all the way to the rear exit, but be sure to ask before the last moment. – – – Please take the baby out of the stroller and fold up the stroller. 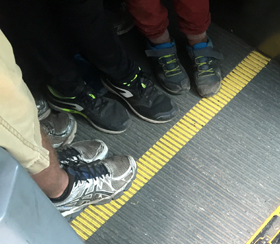 – – -You can wear your ginormous backpack or put it in your lap, but it shouldn’t have a seat for itself if the bus is crowded. 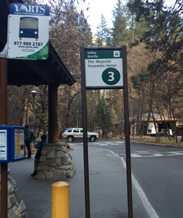 – – – All the free Yosemite shuttle buses are accessible with wheelchair lifts and tie‐downs. Maximum size for wheelchairs on shuttle buses and tour buses is 24 inches wide x 46 inches long with a weight limit on tour buses of 750 pounds. Bus drivers will help passengers on and off buses or notify them of stops. If you need assistance, ask the bus driver. and whatever it is you are listening to on headphones should be at a low volume for everyone’s sanity. – – – If, for example, someone uses two seats on a crowded afternoon, or is yelling into their cell phone, there is no good reason to confront them. You are in a tight space. Let the bus driver deal with rude or obnoxious passengers. Hey, you are on vacation, and the ride will be short. – – – no dogs (or any pets) are allowed on the shuttle buses (or on trails). The main buses go to stops 1 through 21 in that order all day in the summer, (or a few less stops in the winter after a major snowfall). Again, this will make more sense if you print a copy of the shuttle bus map to look at while you read it. If you had come from the Pines campgrounds, Half Dome Village or Housekeeping Camp and got off at the main store in Yosemite Village at stop #2 it would be a mistake to get back on the bus at the stop you got off at to go directly back. If you did you would need to ride a major section of bus route and it could take you an extra half hour or longer to get back. It would make more sense to walk across the street and get on any free shuttle bus that stops at stop #10.
and another photo from a bit down the road, of a bus at shuttle stop 10 on the right, and on the left people waiting for a bus at stop 2. If you had come from the Pines campgrounds and stopped at a Half Dome Village (Curry) restaurant or store (stop 20) and wanted to go back to the campground it would be a mistake to get back on the bus at the stop you got off at. Again, you should cross the street and get on a bus (stop 14) with a shorter ride one less half hour or more to your destination. 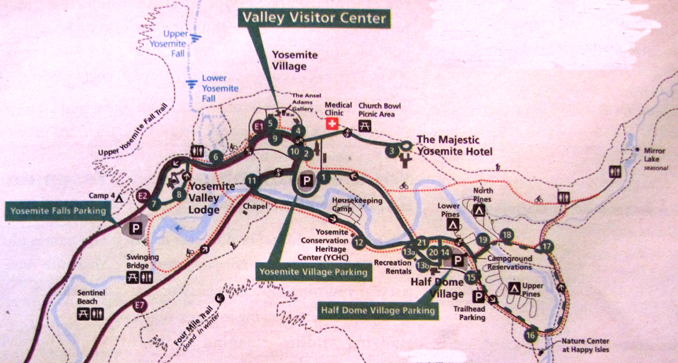 If you had come from the Yosemite Lodge / Camp 4 stops 7 or 8 to the Valley Main Visitor Center stop 9 it would be a mistake (and take you up to an hour longer) to try to go directly back to the Lodge / Camp 4 by getting on a bus at the stop you got off at. Get on a bus at stop 5 for a much faster ride back. Coming from the big Yosemite Village day-use parking lot at stop #1, or from Half Dome Village (Curry), Housekeeping Camp and the pines campgrounds to most destinations in Yosemite Village, (Degnans, Post Office, Ansel Adams gallery, Wilderness Center, Visitor Center, museum) it makes more sense to get off at the main store (stop 2) and walk to the main valley Visitor Center, Degnan’s or the Post Office, etc. than to stay on the bus and ride all the way to the Majestic (Ahwahnee) Hotel (stop 3) and back, unless you need some of the chocolate truffles at the Majestic (Ahwahnee) Sweet Shop. Guests at the Lodge or Majestic (Ahwahnee) and campers at Camp 4 who go ice skating, or rent a raft will have a much longer ride back if they get on at the stop they got off at, again, (most years, please consult a current map) cross the road to the other bus stop for a shorter ride back. 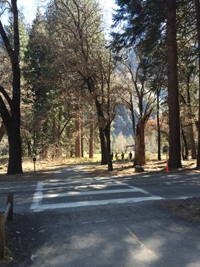 Given how long the wait can be for a bus in the winter it can be faster to walk between the Majestic (Ahwahnee) and the main store/Degnans than to wait for a bus, especially of you just saw a bus leave the Ahwahnee stop. To go from Housekeeping Camp to the main grocery store in the Village, or even to the main visitor center, it can be faster to walk than to take the bus. Use the pedestrian bridge (near unit #48) over the river and follow the trail. or if you use the bus, get on at stop 12 across the road from Housekeeping Camp, and get off at 14 and transfer to 20, so you will not need to ride the bus all the way around the loop to the pines campgrounds / Happy Isles / Mirror Lake / North Pines. If you parked at the Yosemite Village Day Use parking lot and want to go to stop #16 to see Happy Isles or do a Vernal Falls, Nevada Falls or farther hike, you should not get on the bus at the Yosemite Village Day Use parking lot stop #1. Instead walk west through the parking lot, cross the road (please use a map) and use the wide cross walk across Northside Drive to walk to stop #11 to cut at least a half hour off your travels. 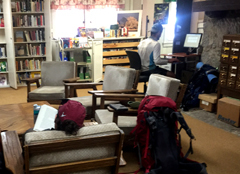 (small fee) art classes The Art Activity Center https://www.yosemiteconservancy.org/yosemite-art-center has lessons and programs “for artists of all ages and abilities”, usually open late March through October, at Happy Isles. Bike rentals, helmet included, are at Half Dome Village (see map at stop #13) and the Lodge (next to the pool, see map at stop #8), spring through fall, some years as late as November. Find a way to bring our own bike, rentals are (ALL of the following is subject to change) as of April / August 2018, (higher prices some previous years) $12 an hour or $33.50 a day. (With an attached trailer $19.25 an hour, $60 a day.) Most years they say that bike rentals start at 8 a.m., last bike out at 3:45 p.m. and bikes need to be back in by 4:45 p.m.; with your own you can ride early and late into the day. 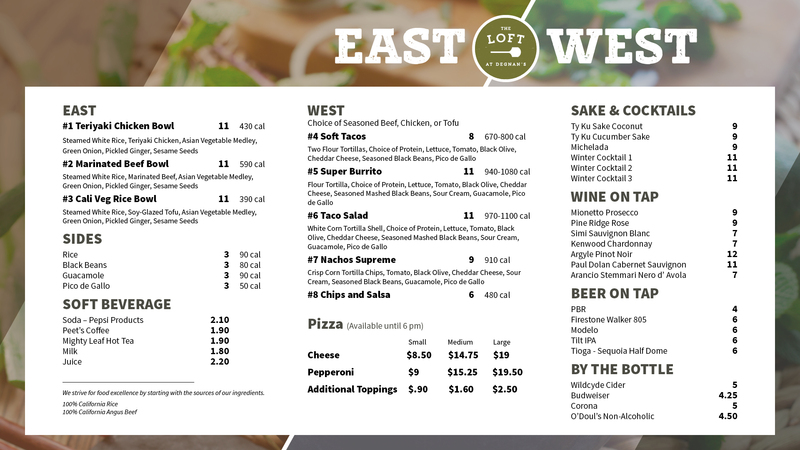 Reservations only available, and often required, for ADA bikes (“hand-crank bicycles, and tandem bicycles for visually impaired guests”). Rental bikes must stay in Yosemite valley and they do not allow you to ride them on all roads that you can ride your own bike on. There are more than 12 miles of surfaced bike paths on the valley floor and even in the winter the weather is sometimes good enough to ride or rollerblade. 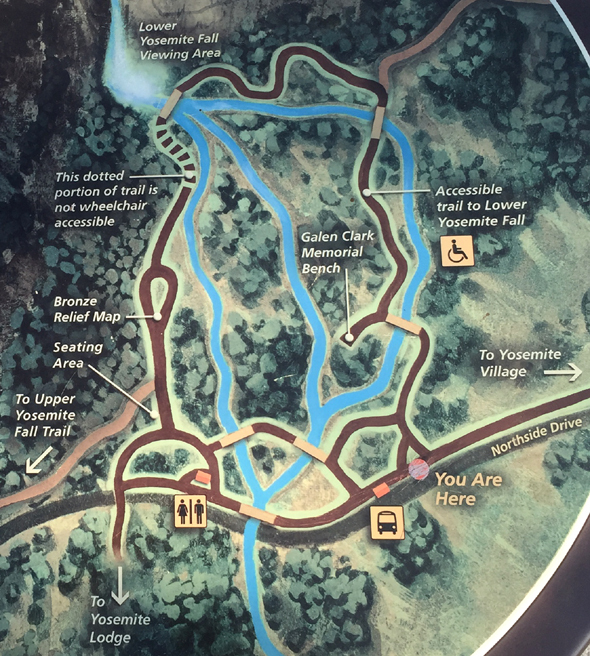 A map of bike paths is at: http://www.nps.gov/yose/planyourvisit/biking.htm and you can ride on paved roads (if you obey traffic laws), but not on dirt trails, on paths closed due to spring flooding or the paved pathway to lower Yosemite Falls. Please walk your bike at the Yosemite Falls pathway or lock it up at the trailhead. You can download a Bird Checklist which lists all the common and uncommon birds in Yosemite, with bar graphs indicating the “relative abundance of a species in suitable habitat at a given time of year.” And find a listing of special status birds (endangered, species of special concern . . .). 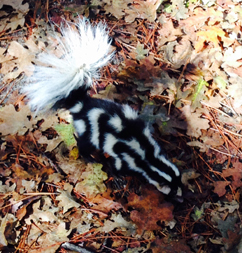 Campground status and campsite availability: call 1 209 372-0266. 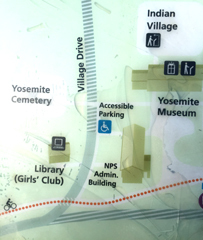 The Yosemite Valley Campground Reservations office is in the visitor parking area at Half Dome Village, stop # 14, at the north-east corner of the parking lot (at the back corner, furthest from Half Dome Village stores/pool/guest check-in). It is much faster for most people to walk to the chapel from Yosemite Village day use parking or from the Lodge or Housekeeping Camp than to ride the bus from those places. hiking advice covers hot weather and winter hiking, logistics, blisters, a gear list, GPS is not infallible and more. 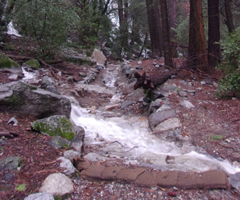 trail conditions: https://www.nps.gov/yose/planyourvisit/conditions.htm#trails It would be wise to ask at a Visitor Center about trail conditions before your hike, but a rockfall could close part of the trail and they would not know about it. In cold weather the trail may also have icy conditions that are not reported. You take your own risks. IF there are any trail closure signs, please follow them. Bikes and pets are not allowed on unpaved trails, but are okay on paved roads and paved bike paths. 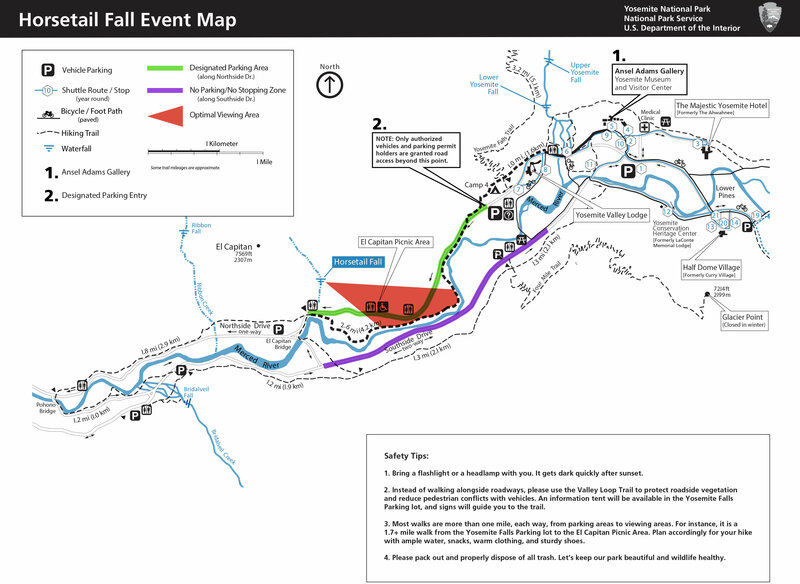 https://www.nps.gov/yose/planyourvisit/upload/wawonahikes.pdf, including Chilnualna Falls, tram route, and the locations of the Fallen Wawona Tunnel Tree, California Tunnel Tree, the Grizzly Giant, Telescope Tree, Fallen Giant and Clothespin Tree. 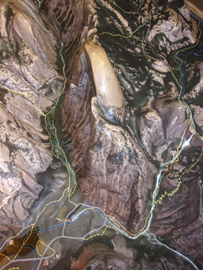 Hetch Hetchy day hikes, including Wapama Falls and Rancheria Falls. use the summer El Cap shuttle. 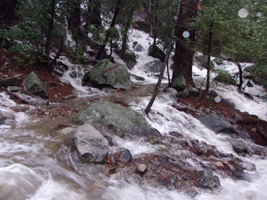 Once at the Bridalveil Fall parking area, the walk is .5 mile (.8 kilometers) round trip. https://www.yosemiteconservancy.org/restoration-bridalveil-fall explains work on restoration of the Bridalveil Fall area. 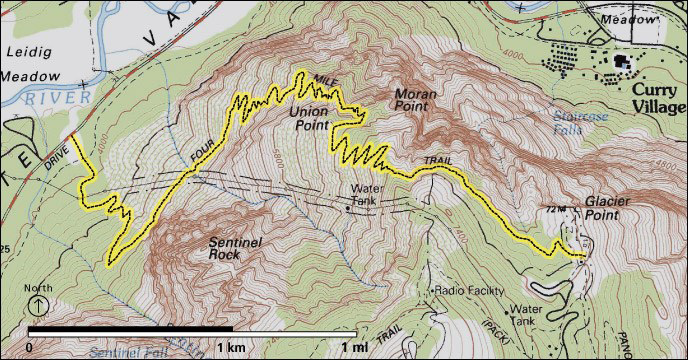 the trail along the cliffs below the Royal Arches, (across the parking lot from the Majestic (Ahwahnee) hotel, the top dotted line on the map below) is longer but can be much more pleasant and less crowded than the paved road from stop 17. 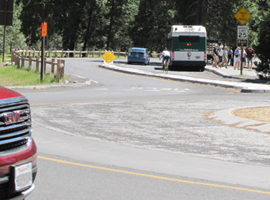 Or make it a loop (to or from) the official Mirror Lake trailhead bus stop 17 (to or from) the Majestic parking lot. You can go directly to the trailhead by walking from the Happy Isles bus stop across the bridge and turning right. The Yosemite valley stable no longer offers horseback riding, you need to go to Big Trees Lodge (Wawona) usually May to early September. http://www.travelyosemite.com/things-to-do/horseback-mule-riding/ This is also where you can pay for a horse-drawn stage ride. Ice skating start at stop #13B. is available at Degnan’s Kitchen (when not too many people are trying to use it). Subject to change, in the past it has been fee, not free and recently one webpage says it is free and another says it is fee . . .
You will find much easier access at whatever concession services facility is allowing people to pay for access (often the Lodge). “From approximately late May through September, a daytime kennel is available at the Yosemite Valley Stable. You must provide written proof of immunizations (rabies, distemper, parvo, and bordetella) from your veterinarian. Dogs under 20 pounds may be considered if you provide a small kennel. 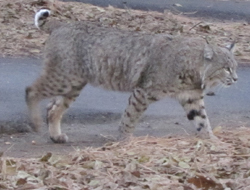 No food is allowed, due to wildlife management concerns. Because of limited kennel space, advanced reservations are highly recommended. Contact 209.372.8326 for more information.” And all this is subject to change. The laundromat is at Housekeeping camp, shuttle bus stop 12. To find the laundromat, bear left when you enter the Housekeeping parking lot. 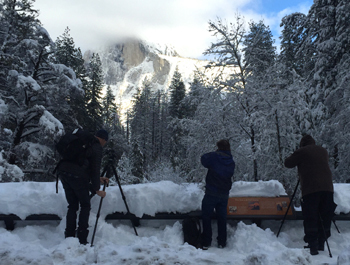 You might sign up for a free or fee photo walk at the Ansel Adams gallery, but the walk could meet at the Majestic (Ahwahnee), check the park newspaper. Ranger talks, walks and evening programs meet at various locations, including in front of the main visitor center, in front of the Yosemite Museum, at a campground/amphitheater, at a shuttle bus stop, at the Lodge amphitheater behind the office, at the El Capitan Bridge, the Majestic (Ahwahnee) hotel shuttle stop or back lawn, check the park newspaper. 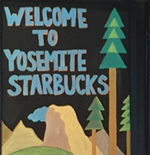 There are restaurants and cafeterias, pizzerias / grill / deli of various sizes and styles at Half Dome Village (Curry Village), Yosemite Village, The Majestic (Ahwahnee) and Yosemite Lodge. 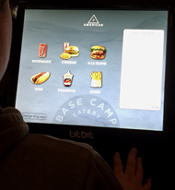 Links to menus for the restaurants are at the bus stop listings for each lodging above. The main grocery at stop #2 has premade individual meal-type salads with dressing packets, and whole or half grilled chickens, plus lots of sliced cheese/meats, crackers/breads, cookies to pack an impromptu picnic from. 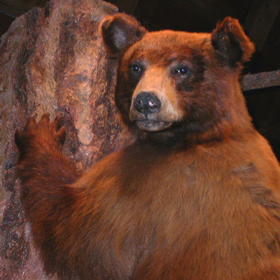 index to over a dozen park webpages with park laws, rules, regulations, policies and prohibitions about pets, bikes, permits, campground regulations, food storage, smoking, speed limits . . . and much more. (Fee) downhill ski and cross country ski/snowboard and (free or very low cost) snow shoe walk with a Ranger Naturalist, use the free winter bus to the ski resort from, usually in this order: Half Dome Village, Yosemite Village, The Majestic Yosemite Hotel and Yosemite Valley Lodge, usually with early morning and mid-morning runs to the ski resort and early afternoon and late afternoon returns. Expect this bus to run on a more rigid schedule than the free valley shuttle buses might. The most Sequoia trees (not actually Redwood trees) are at the Mariposa Grove (see Mariposa Grove links above). •Bicycle paths in Yosemite Valley . . .
Stargazing can be on your own or is offered during many summers above the valley at Glacier Point. Amateur astronomy clubs host star gazing at the Glacier Point Amphitheater (in cooperation with the park). The program is canceled if the sky is overcast. Swimming has details about free for hotel and cabins guests, or pay a fee for others swimming pools with lifeguards and suggestions for swimming in the river in Yosemite Valley. Bridalveil Falls can be seen from viewpoint turnouts along Northside Drive on the drive out of the valley (including Valley View on the left hand side of the road just before you leave the valley, about the time you begin to see directional signs for highways leaving the park), at Tunnel View, at the east end of the Wawona Tunnel along the Wawona Road (Highway 41) and by a short walk from a official Bridalveil Falls parking lot on your way into Yosemite Valley, or by taking the summer-only El Capitan Shuttle (El Cap shuttle) and walking down southside drive to the official parking lot. Cascade Falls is located three miles east of the Arch Rock entrance station, on the left hand side of the road when you drive into the valley, with a parking area just before it on the right hand side. Staircase Fall, (one of the first to dry up after spring flow) comes down from Glacier Point to Half Dome Village, stop # 13b, behind the cabins with bath, and can also be seen at the Half Dome (Curry) Village parking, stop 14 & 20, and from the back lawn of the Ahwahnee, stop #3 and various other places. Vernal and Nevada Falls, as well as Illilouette Fall can be seen from Glacier Point (road open only in the summer/fall) or by trail from Happy Isles, shuttle stop #16. Yosemite Falls can be seen from many viewpoints in meadows and along roads in Yosemite valley. To walk to the base of lower Yosemite falls, go to shuttle stop #6. 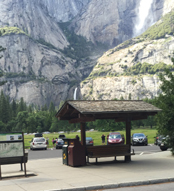 To hike to the top of upper Yosemite Falls go to shuttle stop #7. Is that pollution from a nearby or far away forest fire, ozone and fine particles from other sources to our west? Yosemite National Park’s air quality page has answers and NOAH maps: https://www.nps.gov/yose/learn/nature/aqmonitoring.htm Campfires are banned in Yosemite Valley parts of some days of the year, see campground regulations. The Yosemite Guide newspaper, which you will be offered a copy of as you pay at an entrance station to enter the park, (or you can read, download or print in advance) has hours of operation for visitor centers, museums, tours, stores, food service, post office, laundromat, showers, auto service, gas stations, and a calendar of park activities including Ranger walks. Things to do during a Yosemite snow storm besides hiding in your tent uses the free valley shuttle bus. Half Dome (Curry) Village canvas tent cabins numbered in the 1100s, 700s and 600s are closer to stop 15 than to the Half Dome (Curry) Village stops #14 and #20. Half Dome (Curry) Village canvas tent cabins numbered 1- 9 and all of the wood cabins (numbered with a letter after the number, such as 1D, 8A or 22B) are closer to stop 13B than to the Half Dome (Curry) Village stops #14 and #20. Yosemite Lodge buildings Laurel and Juniper are closer to the Camp Four bus stop #7 than the official Yosemite Lodge stop #8. Buildings Tamarack, Dogwood, Aspen, are about equal distance to the Lower Yosemite Falls stop #6. Campers in Upper Pines campground in the higher numbered campsite loops (188 – 240 and 158 to 187) will find that it is a much shorter walk from the Happy Isles stop 16 to their campsite than from the official Upper/Lower Pines campground stop(s) 15/19 at the west end of the campground. This makes these campsites the best for a short walk back after a Half Dome or Mist Trail hike that took a bit longer than you expected and ended after the buses are running. Campers in the lower half of Upper Pines and all of Lower Pines will find the stop at #15 gets them to their campsite faster than riding all the way to Happy Isles, the stop at the end of the road to Mirror Lake, past North Pines then finally getting off at the #19 stop at the entrance to Lower Pines. Campers in the higher numbered sites in Lower Pines (60s 70s, 80s, etc.) 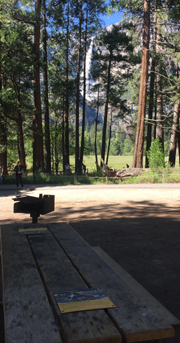 will often find when there are lines for and waits for space on the buses at Half Dome (Curry) Village, it is more pleasant (and sometimes faster) to walk to their sites, using the boardwalk across Stoneman Meadow. In spring in snowy years, the trail from the back end of North Pines (and over the footbridge) to the backpacker’s walk-in can be flooded with ankle deep or deeper water. You might find it more convenient to park as directed at Half Dome Village (formerly Curry Village) day use parking, grab your gear and make sure there is no food / toiletries / scented fish bait / old french fries under the seats in your vehicle, get on nearby shuttle bus stop 20, then get off at the Ahwahnee (Majestic) stop #3, (maybe making a stop at the largest Yosemite Valley grocery at stop 2 on the way). You will find it is a slightly shorter walk from the Majestic (Ahwahnee) bus stop through the parking lot, and Valet parking lot, then make a left and along a paved back road to backpacker’s walk-in campground than from the back end of North Pines IF you can find the way on the back road, but you have a topo map, Yosemite Valley map in the park newspaper, right? And you won’t need to move your vehicle back and forth. 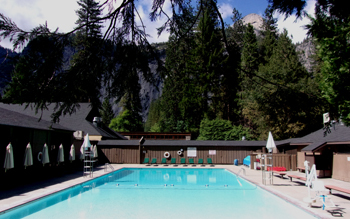 The Majestic (Ahwahnee) stop would also be a much shorter bus ride from backpackers walk-in to and from the main store, the cafeteria at the Lodge or to visit friends at Camp Four. Food choices at the Majestic Bar (less dinner dress code than the dining room) are at: http://www.travelyosemite.com/media/690091/bar-menu_the-majestic-yosemite-hotel-bar.pdf Chocolate truffles / a multitude of trail snacks are located in the Sweet Shop. Hotel map. 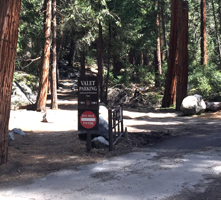 There are three large free day-use parking lots in Yosemite valley for people who are staying at hotels/campgrounds outside of Yosemite valley. Suggest that in the summer (or even spring – fall, especially on weekends and holidays) you get to the valley early in the morning to find a parking space and miss out on waiting in the long lines at the entrance stations. When you find parking, take a picture on your smart-enough phone of your parking space /vehicle from a few steps away, so you will be more likely to be able to find it. Note which bus stop / store. etc. you were closest to. The free shuttle bus stops at each of them. There are sometimes a few reserveable day-use parking spaces. 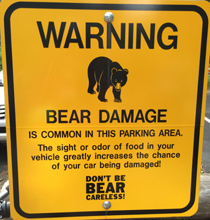 See details and advice at Parking and Traffic Jams in Yosemite valley tips and tricks. This bus was free for years, but see below for recent rates, $1 per trip to much more for longer routes. These next buses run on a much more strict schedule than the free Yosemite Valley shuttle and fee Tuolumne shuttle described above. People who do not plan ahead to get to where the bus departs from in time have found themselves left behind. There is a (fee) daily hiker’s bus in warm months with stops along the road between Yosemite Valley and Tuolumne Meadows. 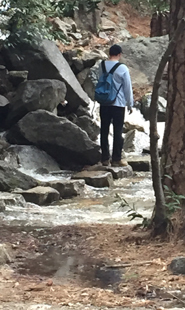 You can plan to start a day hike up in the high country and hike a trail down to the valley, including the Snow Creek trail/Mirror Lake trail and Upper Yosemite Falls trail. FAQ: I can find Camp 4, but what are people referring to when they talk about Camp 11 or Upper Tecoya?? 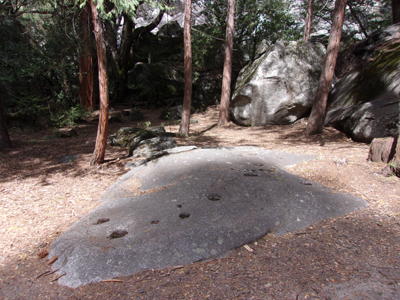 Yosemite Place Names has locations and/or information about Camp 1, Camp 2, Camp 3, Sunnyside Walk-in Campground, Swan Slab Meadow , Columbia Boulder, (or Big Columbia), Camp 6, Camp Tresidder, Camp 7, Lower River Campground, Camp 8, Camp 9, Camp 11, Clark’s Campground, Camp 12 , Camp 13, Camp 14, Camp 15 , Upper River Campground, Camp 16, Camp 17, Camp 20, Lamon Campground, Happy Pines Campground, Yosemite All-Year-Round Hotel, Ahwahnee 6th floor roof garden and dance hall, Library Suite, Sunroom, golf course, Naval Special Hospital, Ash Can Alley, Basket Dome, Boy’s Town, Bug Camp, Camp AE Wood, Camp Yosemite, Camp Lost Arrow, Chinquapin, Chowchilla Mountain Road, Crane Flat Complex, Tamarac Complex and Mariposa Complex, Curry dump site, Curry orchard, Devil’s Bathtub, El Cap Crossover, Ferguson rock slide, Fort Yosemite, Gentry Station, John Muir Hotel, Kenneyville, Great Sierra Wagon Road, La Casa Nevada, Alpine House, Le Conte Memorial, McCauley Cabin, Miller Cascade, Miwok round houses, Monroe Meadows, Northside Drive, Ostrander Ski Hut, Ranger’s Club, Rancheria Flat, Railroad Flat and Abbieville (Hennessey’s Ranch), River Straight, Southside Drive, Stoneman House, Taft Toe, Tecoya (Upper, Middle and Lower), Thousands Cabins, Too-lool-a-we-ack, Train Wreck, Village Drive, Wahhoga (or Wah-hoga), Wosky brown, Wosky Pond.